The web is full of hipsters scouring the indie music scene for the next big thing. And while there is no shortage of communities where these trendsetters can share their picks, they’ve never stood to gain anything from being ahead of the crowd (aside from a slight sense of superiority). Popcuts, a Y Combinator-funded music store that launches today in public beta, is looking to reward these early adopters by paying store credit to the first people who buy a song that later goes on to become popular. When an artist signs on to the store, they allocate a certain portion of the revenue generated by their songs to go back to their fans. This money is then distributed according to how early each user purchased a song (the earlier you buy, the more you make). For example, the band My First Earthquake has decided to pay out 30% of its revenues to its fans. The earliest adopters (say, the first dozen people to buy the song) will break even after the song has been purchased by around 25 other people. Fans buying the song later on will still earn credit, but it will be earned at a much slower rate (the site will tell you how quickly you’ll be earning credit before you buy a song). For the time being Popcuts is only selling music from unsigned indie artists, but CEO Kevin Lim says that the company will pursue deals with record labels once it has perfected the new payment model. Popcuts has a compelling idea, but its success may well lie in the generosity of the artists it signs. The store’s default split gives 60% of revenues to bands, which is competitive with other online stores. But the default 30% allocated to fans may not be enough of an incentive to drive many more purchases, and bands may find they have to give up more of their proceeds to drive sales. In any case, it’s an experiment that the music industry will probably be following closely. 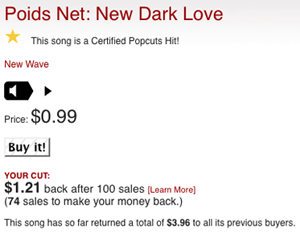 There are a number of other music stores experimenting with new pricing models for music. Most notable is Amie Street, which initially sells a song at 1 cent and increases the price as it rises in popularity (like Popcuts, this rewards early adopters, but it does so in a different manner).